China Crisis and X Simple Minds will bring back their local audiences to the good old days with their awesome hits in the 80s and 90s. PHOTO CAPTION: China Crisis (top) and Simple Minds will capture the hearts of Filipinos with their pop performances on September 9, 2011. After staging a successful concert in the Philippines last January, China Crisis is back to captivate Pinoy hearts. This time, they will be joined by another group that became popular in the '80s, Simple Minds. The show will be a nostalgic trip back to the seminal days of their fame. 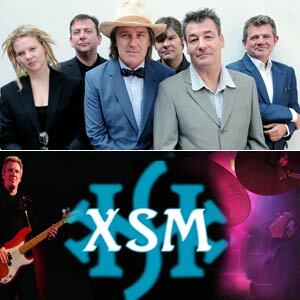 Their concert titled China Crisis X Simple Minds will take place on September 9, Friday at the SMX Convention Center. Local band Kenyo will serve as their front act. China Crisis started in Liverpool, England by Gary Daly and Eddie Lundon. The two started working together in 1979 after leaving school. Their first single "African and White" was released in in 1982. The band was then signed by Virgin Records who re-released "African and White," allowing it to become a minor UK hit, reaching No. 45 in the singles chart. Their debut album Difficult shapes and passive rhythms, Some people think it's fun to entertain—surfaced in late 1982. The English duo then launched the album Working with fire and steel, Possible pop songs volume two and their single "Wishful Thinking" became their biggest hit, reaching No. 9 in the UK and charting all over Europe. It was voted most popular song of the week on the Swedish radio show Poporama in the spring of 1984. In their upcoming concert, China Crisis promises to keep the arrangement of their hits "Wishful Thinking," "Highest High," and "Black Man Ray." On the other hand, this marks the first time that members of the Scottish group Simple Minds will perform here in the Philippines. In 1977 Jim Kerr and Charlie Burchi ll, along with drummer Brian McGee, formed a punk band named Johnny & the Self Abusers. After an unsuccessful single, the bands line-up was quickly reshuffled and their name was changed to Simple Minds. In 1978 Derek Forbes joined Simple Minds—initially he stood in as bass player as a favor, for a gig at the infamous Mars Bar in Glasgow. This was Forbes and McGee's first ever gig together, and the start of the most popular and creative period of their career. With their band's ups and downs, Derek Forbes has once again formed the partnership he shared with Brian McGee in the '80s and '90s. Simple Minds, whose biggest hits are "Don't You (Forget About Me)," "Sanctify Yourself," and "Alive and Kicking," as well as firm fan favorites "The American" and "Glittering Prize." They are also known for songs such as "Chelsea Girl," "Changeling," and "Theme For Great Cities." China Crisis and Simple Minds will remind local audiences of the good ol' days with their awesome hits in the '80s and '90s. The concert China Crisis X Simple Minds is presented by Steve O'Neal Productions, Manila Bulletin, and MS for Male Tablet.